Bishop Estate Chairman Richard "Dickie" Wong has been indicted on charges that he received a $115,800 kickback from a developer that bought the land under the Kalele Kai condominium complex from the estate. Wong, 65, was charged by an Oahu grand jury today with one count each of first-degree theft, conspiracy and perjury stemming from the purchase of his condominium at an inflated value. His wife, Mari Stone Wong, was charged with conspiracy and giving a false statement. Wong's brother-in-law Jeffrey R. Stone, also indicted in November in a similar alleged kickback scheme with trustee Henry Peters, was charged with conspiracy, commercial bribery and promoting first-degree theft. The charges stem from 1996 real estate transactions. According to today's indictment, the Wongs and Stone contracted to convey a $1 million Kahala home to the Wongs in exchange for $613,000 credit for the Wongs' Makiki condominium, $100,000 in cash and $395,000 in mortgage. Just before the transaction in April 1996, Pacific Northwest Ltd., of which Stone was president, bought the Kahala home with $1,017,401.61 borrowed from One Keahole Partners. The indictment says One Keahole Partners was the entity through which National Housing Corporation of Hawaii and Pacific Northwest bought the Bishop Estate fee-simple interest in Kalele Kai. The Wongs also contracted to convey the Wilder Avenue apartment to Stone's Pacific Northwest Ltd., which also issued the mortgage. In July 1997, Stone had the Wilder Avenue apartment sold by Pacific Northwest for $425,000. 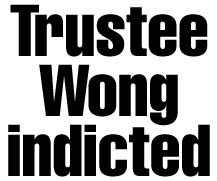 The indictment says Wong committed perjury by testifying before the grand jury that he never knew an appraiser visited his Wilder Avenue home. The indictment says Wong was trying to disavow any knowledge that he knew he was receiving an improper bonus or commission from Stone.